We work hard to provide a friendly, accessible environment for all our visitors and the widest possible access to our trails, buildings and events. Moors Valley is easily accessible by car, sign posted with brown tourist information signs from the A31 at Ashley Heath or approach roads from West Moors. You must be visiting in the car that the tax exemption applies to, for the free parking to apply. For regular visitors an annual pass is available. Our friendly staff at the Information Point in the Visitor Centre are happy to help advise you on the best routes available to suit your needs to make the most of your visit. The Visitor Centre is approx 100m from the Visitor Centre along a tarmac footpath which is fairly smooth however there are some short sections where the gradient is 10% or more. Access to the Visitor Centre is through wide automatic doors. An induction loop is available and we are happy to provide large print leaflets on request. A braille version of the map leaflet is available on request. Dogs, including assistance dogs are welcome at the Information Point and in the exhibition area. At the rear of the Visitor Centre there is a patio area for the restaurant which can be accessed via a slope. Wheelchair accessible picnic tables are provided. The toilets including a Changing Places standard toilet with tracking hoist system (Safe Working Load is 200kg / 440lbs maximum) and height adjustable changing bed, an Ambulant Disabled toilet and large family cubicles can be found on the outside of the building. A RADAR key is required for the Changing Places standard toilet, please ask staff at the Information Point for a loan key if you do not have your own. Additional accessible toilets can be found at Kingsmere Station and in the Golf Centre. There are many paths and waymarked trails at Moors Valley covering a range of terrain and habitats. Some routes are more accessible than others. Please contact the Rangers if you would like to discuss which of the paths may be most suitable to your needs. The waymarked routes are marked with posts with a band in the appropriate colour. Colourblind visitors might struggle to tell the difference between some of the colours. A map showing all the routes is available from the Visitor Centre, priced £1. A fairly flat tarmac path around Moors Lake with plenty of resting places along the route. There is however one short steep rise and fall over the railway (1:4 and 1:5 gradient) which might be difficult in a low powered mobility scooter or manual wheelchair. A handrail is provided on this section. Toilets at the Kingsmere Railway Station can be found half way along the route. Waymarked with round posts with brown bands. A more detailed accessibility map is available to download for this route. A Large Print Guide is available to borrow from the Visitor Centre for this trail giving information about the wildlife you might see or hear. Please ask at the Information Point for a copy. 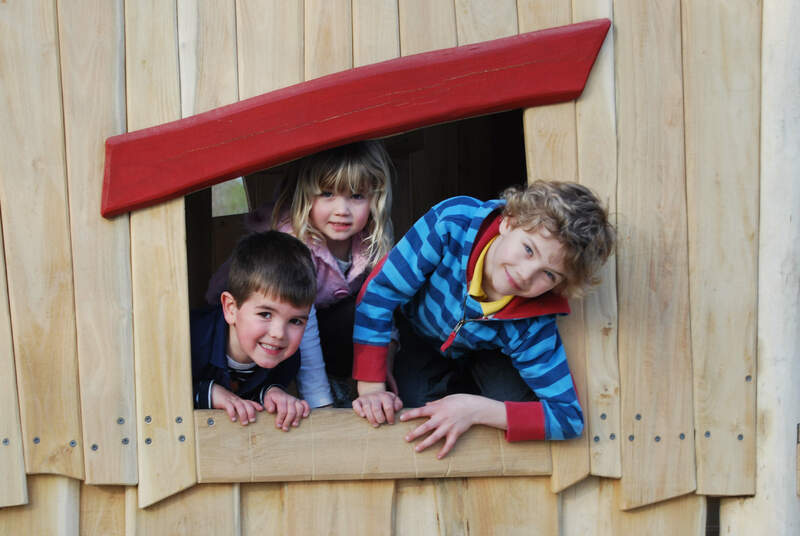 Clearly waymarked by fingerposts and with 10 unique wooden play sculptures along the route, the Play Trail is a favourite with families. The trail follows unsurfaced forest tracks so there can be uneven sections and exposed tree roots in places, so if you have anything other than an all-terrain mobility scooter please ask a Ranger for suitability. The optional extra route takes you to the Tree Top Trail which is unfortunately not suitable for wheelchairs or mobility scooters, however these can follow the connecting path on the ground. Picnic tables are provided at the Snake Pit and Webs structures. Starting at the Visitor Centre this circuit takes you in a loop through the Forest along level, wide compacted gravel tracks. This track is also a cycle route. This loop can be accessed from the Corsican Circuit and takes you alongside the Crane Lake and River through the Golf Course. Mainly tarmac with some gravel and dirt sections, narrow in places with one short hill. Suitable in all weathers. There is an additional section which takes you out of Moors Valley into Potterne Park and returns via Potterne Wood. A map showing the most accessible tracks is available from the Information Point. Two ‘Tramper’ mobility scooters are also available to hire as part of the South West Countryside Mobility Scheme. Please see the Countryside Mobility Scheme page for details of how to join and membership fees. Fishing – A platform to enable people in wheelchairs to fish is located on the Moors Lake. At times of particularly high water, this platform may be submerged. Moors Valley Railway – Seats on the railway carriages must be straddled. Staff are on hand to assist someone in and out of a railway carriage. Please speak to the railway direct to find out about the suitability of the carriages (01425 471415) but unfortunately the railway cannot accommodate a wheelchair. Steam locomotives emit smoke, steam and ash and also have loud whistles. Go Ape Tree Top Adventures – Whilst the courses are designed to be accessible to most people they do offer a degree of physical and mental challenge. For some persons with additional needs this may mean that additional equipment and/or levels of supervision will be required for safe participation. For others the risks of injury may still be too great despite taking such additional measures, preventing their use of the course. Please contact Go Ape for further information (0845 6439215). Cycling – A fleet of adaptive bikes, including hand powered bikes are available to use at Moors Valley during Accessible Cycling sessions on Tuesday and Thursday mornings. Please see the events pages for more information. We have a ‘Visual Story’ of Moors Valley Country Park designed as a guide for people with autism. Moors Valley has a full range of events throughout the year. Most can be adapted to meet individual requirements. Free Wifi is available at the Visitor Centre. Mobile reception across the site varies between providers. Emergency calls can be made from the Visitor Centre – please ask the Rangers at the Information Point. The information below is intended as a guide and has been collated from each of the mobile providers online coverage search tools. We are committed to inclusivity and work hard to provide a friendly, accessible environment for all our visitors and the widest possible access to our trails, buildings and events.